It’s not easy for busy professionals to be able to travel to a neighbor island for an entire weekend of professional development, but the 2015 AHA Annual meeting was certainly worth every moment (and dollar) spent on Hawaiʻi Island. From beginning to end, the daily agendas were very thoughtfully planned, well coordinated, and cheerfully managed. The learning opportunities abounded, not just because of the many significant cultural sites selected for visits, but also because of the wonderful librarians, archivists, cultural resources, and eager students in attendance. The collective knowledge and experience of the 35 attendees was impressive and an experience unto itself. Upon arrival at the Kona airport, folks gathered and greeted each other with smiling faces and open arms. Our diligent planning team had already skillfully mapped out all of the travel routes, checked the weather, traffic (yes, there was traffic in Kona, unfortunately due to a terrible accident), saw to our transportation, and quickly had us excitedly on our way to our first destination, the Kona Historical Society. Though we were in traffic, we had plenty of time to admire the stunning scenery and enjoy lovely conversations with friends, both old and new. The group was treated to pastries and beverages at our first destination and also had time to sit and talk before being introduced to the history of the site. Our hosts shared about a specially created experience for the group, which was to include some time in the library and archive as well as being participant observers in a shopping experience at the general store, which would have been typical to the period of the areas’ earlier inhabitants. We then continued to the Kona Coffee Living History Farm for an introduction to the site, the mission and activities of the managing group, and self-tours of one of the farm’s historical Japanese family living areas, coffee roasting facilities, and key fruit plant setups. The group enjoyed an ʻono bento lunch and a variety of refreshing drinks, including 100% Kona coffee from the farm! Our next visit was to Huliheʻe Palace. Known to have been a home of Princess Ruth Keʻelikolani as well as other Hawaiian aliʻi, the grounds and building are full of historical items and incredibly interesting stories. After checking into our rooms at the Kamuela Inn and freshening up, we went to Parker Ranch’s Pukalani Stables, where the group was given private access to the Paniolo Heritage Center. Viewing all of the pieces of paniolo history, and reading through the many histories of Parker Ranch cowboys and cowgirls, set the stage for our evening speaker, Dr. Billy Bergin, longtime Parker Ranch veterinarian and cowboy. Following an excellent buffet dinner in the private dining area, and an incredibly informational talk by Dr. Bergin, the group returned to the Inn to rest and reflect on a busy, but lovely, day. All welcomed the following Kamuela morning in different ways. Some slept-in a bit and enjoyed muffins and coffee at the Inn, others were up early to explore the town on foot and try some recommended local breakfast spots. Before we knew it though, we were checked out and on our way to Honokaʻa to visit the North Hawaiʻi Education and Research Center (NHERC), to be hosted by Dr. Momi Naughton, and have our 2015 Annual Meeting and lunch. Dr. Naughton pulled several fascinating items from the collection and shared stories about each item that captivated us all. Every moment there was much appreciated! The close of our second and final day was spent at Puʻukoholā heiau and the Kīholo Bay Scenic Overlook. 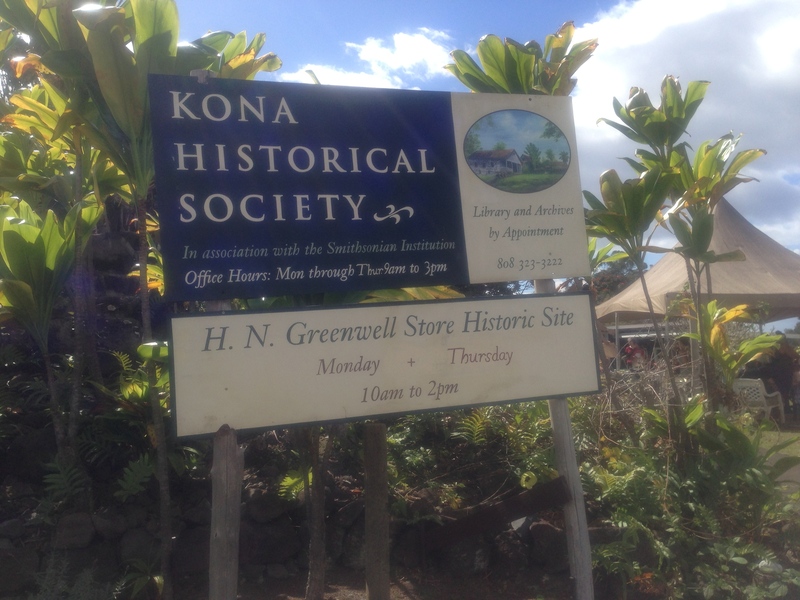 AHA’s own Kepā Maly and Helen Wong-Smith shared information about Puʻukoholā, an extremely significant Hawaiian cultural site, as well as the development of and access to an informational database about the site. Mahalo NUI to them both for all the valuable information shared! The return home after a weekend full of such great fellowship and sharing of valuable information was a bit sad in that we all had to part ways. But it was also very exciting to know that we were now much more fortified with knowledge, experience, and an expanded personal network to better represent our organizations and serve our users. Mahalo piha to each member of the planning committee for a phenomenal job done in coordinating this year’s Annual meeting! More of Malia’s photos can be viewed on Flickr! Thank you, Malia, for your detailed recap of the AHA annual meeting on the Big Island. It was an enjoyable trip and a great opportunity to see what other archives and cultural sites are doing. Thank you to the planning team for such a well organized trip. The rest of us didn’t have to worry about a thing.